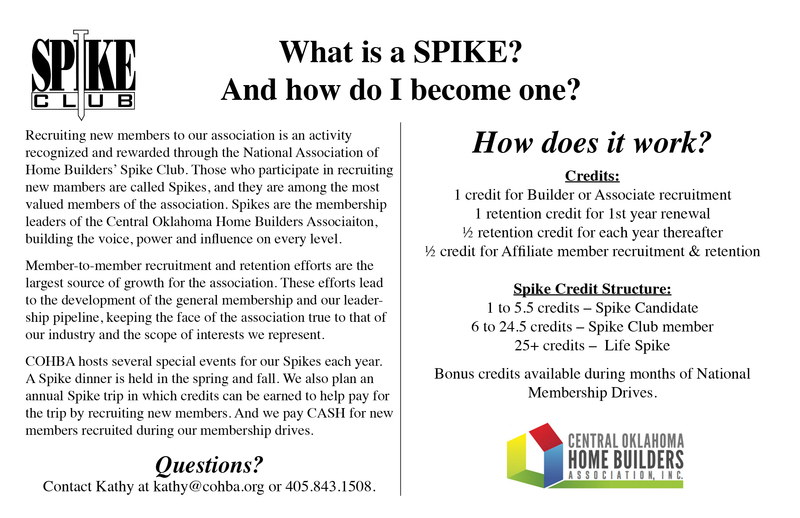 Recruiting new members to our association is an activity recognized and rewarded through the NAHB Spike Club. Those who participate are called Spikes, and they are among the most valued members of the association. Spikes are the membership leaders of COHBA, building the voice, power and influence on every level, in every state. Member-to-member recruitment and retention efforts are the largest source of growth for the federation. Spikes bring grassroots growth and stability. These efforts lead to the development of the general membership and our leadership pipeline, keeping the face of the federation true to that of our industry and the scope of interests we represent. COHBA hosts several special events for our Spikes. We host two dinners a year as well as go on special trips that can be paid for by recruiting new members. Moreover we pay CASH for members that are recruited during our membership drives. Would you like to become a spike? Click here for information for potential members to show the value of membership!